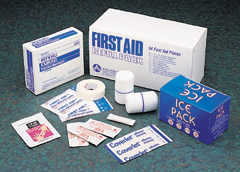 Contains ten most frequently used products (94 pieces): 1" x 3" adhesive bandages, knuckle bandages, fingertip bandages, sterile gauze, antiseptic wipes, sting relief wipes, ice pack, burn ointment, nonstick pads and tape. Shpg. wt. 4 lbs.